This is an Extra Detail Magnification (or "EDM") obtained from the fascinating Contextual Image (or "CTX Frame", for short) of the Dwarf Planet 1-Ceres, taken by the NASA - Dawn Spacecraft on March, 25nd, 2016, which showed us a small portion of the Western Rim of Azacca Crater. A smaller Impact Feature sits on its East-facing Flank (very well seen here). Of particular interest in this scene is the great number of small, Bright Spots (whose Nature is, of course, still unknown), which are located both in the Southern and Northern part of the picture (see the previous APOD). 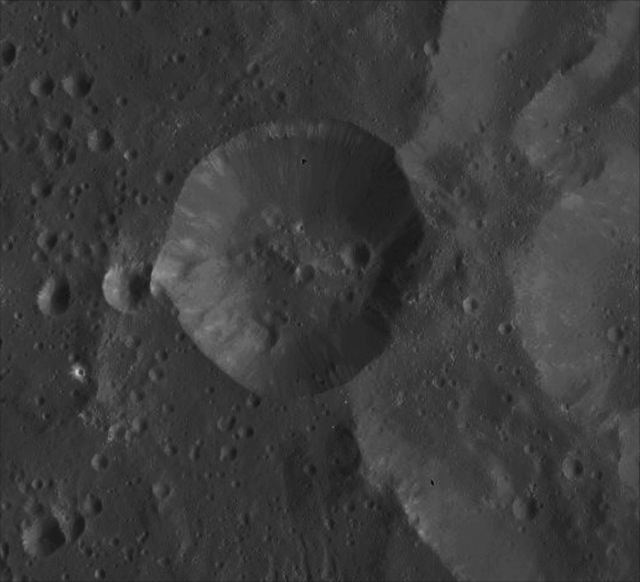 Also of interest are the truly narrow Fractures in the Terrain around Azacca Crater. The Fractures (visible on the lower side of the EDM) are arranged in a pattern that is concentric as to the Crater's Rim, but they do not penetrate through the smaller Impact Scar. What does that mean in your opinion? The Original View was centered at approximately 7� South Latitude and 218� East Longitude. The NASA - Dawn Spacecraft captured the scene during its Low-Altitude Mapping Orbit (or "LAMO", for short), from an approx. altitude of about 240 miles (such as roughly 386,2416 Km) above the Surface of 1-Ceres. The Image Resolution is approx. 120 feet (i.e. about 36,576 meters) per pixel (---> Picture Element). This image (which is a crop obtained from an Original NASA - Dawn Spacecraft's b/w and NON Map-Projected frame published on the NASA - Planetary Photojournal with the ID n. PIA 20670 - DAWN LAMO Image n. 90) has been additionally processed, extra-magnified to aid the visibility of the details, contrast enhanced and sharpened, Gamma corrected and then colorized (according to an educated guess carried out by Dr Paolo C. Fienga-LXTT-IPF) in Absolute Natural Colors (such as the colors that a normal human eye would actually perceive if someone were onboard the NASA - Dawn Spacecraft and then looked ahead, towards the Surface of 1-Ceres), by using an original technique created - and, in time, dramatically improved - by the Lunar Explorer Italia Team.